How to Restore Formatted Hard Drive ? Many people may encounter this problem: after you formatted a hard drive, you found that there are still some valuable data on the hard drive. Or you found that you formatted another hard drive, not the drive which you want to format. All the data of the formatted hard drive will be lost, such as documents, multi-media files and programs, etc. Many of these lost files are very important to you. At this point of time, formatted hard drive recovery is usually the first choice people turn to solve their formatted hard drive data loss issues. Actually, when you format a hard drive, the Operating System erases all bookkeeping information on the hard drive. But please note that formatting a disk does not erase the data on the disk, only the data on the address tables. So if you accidentally format a hard drive that has useful data, please don’t panic. A free formatted hard drive recovery with powerful data recovery software is the best choice. After a long time seeking and experience, I would like to share a free data recovery software, Wise Recovery , which can do free formatted hard drive recovery in a simple and fast way. Recycle bin has been emptied. How to Recover Images from Hard Disk? WiseRecovery lets you scan and recover your affected volume and shows you the files it’s found prior to purchase. Combining all the existing backup techniques and exclusive recovery environments, this latest edition satisfies the needs of even the most demanding user and is simply the most powerful backup tool available today. WiseRecovery allows you to take complete control of your PC’s safety. Complete and effective recovery: recover all lost data including documents, emails, photos, videos, audio files and more. Safe and easy to use: friendly recovery wizard applies to all levels of computer users. Most importantly it works no damage to the data. Preview before recovery: preview function helps you to locate your lost files and check their quality before you decide to recover them. Total recovery: not only recover files from hard drives, but also get lost data back from RAID, dynamic disks, USBs, external hard drives, memory cards, digital cameras, MP3/MP4 players and more. As a powerful partition recovery software, recovering various kinds of lost & deleted partition, WiseRecovery is capable of recovering lost or deleted partition induced by MBR, BPB, partition table damage, improper operation, accidental deletion, virus attack and system crash, etc. Additionally, Wise Recovery is compatible with multiple operating systems, not only common Windows XP but also 32 or 64 bit editions of Windows 8, Windows 2000 professional, Windows XP, Windows7, Vista, etc. How to Restore Corrupted Hard Drives? WiseRecovery is an outstanding WiseRecovery program. User can utilize this hard drive recovery software to recover hard drive including formatted hard drive recovery, repartitioned hard drive recovery and virus-plagued hard drive drive recovery. This Hard Drive Recovery software allows user to free recover hard drive data. WiseRecovery presents people an easy-to-use interface and it will scan your hard drive automatically which can save user’s time at the same time. Hard Drive is also shortened as HDD, one of the main media storage devices. Many famous companies produce hard drive in their daily manufacture, such as Seagate, Western Digital, HITACHI, TOSHIBA and Samsung. Hard drive is extensively used on many digital devices, such as cell phones, laptops, desktops, cameras, SLRs, MP3 player and so on. However, once your hard drive is corrupted, is it possible to recover your hard drive data completely? Is there a way to retrieve files from the corrupted hard drive? Yes! How to Restore Deleted Photos? WiseRecovery is ranked in the top as it is a leading hard drive and memory card Recovery Program for many kinds of memory cards. WiseRecovery can recover many kinds of memory cards, for example: SD card, miniSD, SDHC, MicroSD (TransFlash) card, Compact Flash card, CF Type I, Type II, MicroDrive, CF card, Memory Stick, Memory Stick Pro, Duo, Pro-HG, XC, Micro (M2), MultiMedia card, MMC card, SmartMedia, flash card, xD Picture card, etc. Data recovery can be a daunting task. Therefore, if you are not sure you can cope with such a task, let professionals do their job. Yes, this might be quite expensive. So, paying 100-200 dollars for data recovery is quite common. Luckily, here is the good news. You can also choose WiseRecovery. It is efficient, not expensive and easy to use. As it has several years’ history on recovering and retrieving SD cards, many people rely on it very much and it is and will be their first and best choice. It presents their customers an easy-to-use interface. Even though you are a computer novice, you can undelete your Corrupted memory card with WiseRecovery. WiseRecovery can undelete all daily files, data, but also images, pictures, music, audios and videos with almost all kinds of formats: PNG, TIFF, INDD, JP2, PSD, Paint Shop Pro Image File (PSP) for picture; M4P, RPS, AIFF, MIDI, M4A, AU, OGG, WMA, RM, Real Audio (RA) for audios; DV, M4V, 3G2, M4B, AVCHD Video File (MTS), Divx Encoded Movie File (DIVX), Matroska Video File (MKV), MOI Video File, OGG Media Player (OGM), Video Object File (VOB), 3G2, ASX for videos. Most people choose WiseRecovery to recover their lost things as the SD card recovery software can retrieve data, there is no need to say, but one of the additional reason is it is easy-to-use and totally risk-free. The young and old can also operate it without any problem. This card recovery software enables the quick recovery of photos from different storage devices in just three steps. To sum up: 1.Connect Card to Your Computer. 2. Perform a Full Scan. 3. Recover Lost SD Card. Another reason is because its high quality of refund policy. If you don’t content of WiseRecovery, you have 60 days money back guarantee. Good service is another characteristic. have you ever deleted important data on cell phones? Many people may get in panic when whey met data lost on cell phones. Now with WiseRecovery, you will don’t need to worry about it again. WiseRecovery is a professional data recovery software which is specialized in recover data on memory device, like memory card, computer, USB, phones and so on. It can rescue all your files from formatted or corrupted memory card. it is able to support photos, pictures, emails, images, music, video, and other multimedia files. In addition, WiseRecovery have several years’ history on recovering data. So it is the first and best choice to many people who lost files on memory device. One of advantage of WiseRecovery is no risks.it will not cause more damage or corruption to your SD card. so just have a try! How to undelete lost photos form formatted hard drive? Are you upset for you formatted hard drive? Do you know how to undelete lost files and data? Wiserecovery is launched for these purposes by Lionsea.com. Wiserecovery is professional file recovery which can indeed help people to undelete hard drive, flash drive, USB drive, memory card, SD card and many other devices. This data recovery can do much for you? Support All File Formats: Images, Audio files, Video files, Emails, Documents, Archives, etc. Support Almost All File Systems: FAT, CramFS, JFS, Linux, RAID 4, RAID 6, NTFS, XFS, BeFS, BSD disklabel , HFS, RAID 1, RAID 5, LVM, etc. Support Wise Device Error Messages: “Format error”, “file error”, “Write error”, “Read Error”, “Memory card error”, “SD card error”, “Corrupted data error”, etc. Wide System Compatibility: WiseRecovery is compatible with all versions of Windows operating systems such as Windows 7, XP, Vista, 2000, 2003, 2008, 32 and 64 bit. And Mac OS X 10.8 (Mountain Lion), X 10.7 (Lion), 10.6 (Snow Leopard), 10.5. How to undelete formatted drive? People always sent emails to communicate with each other. Email can be regarded one of most important communication way. People can send important files and data, transfer photos between each other. But if you delete emails by accident or after you empty spam and you found there is important email there, what do you plan to do? Wiserecovery can really help you. 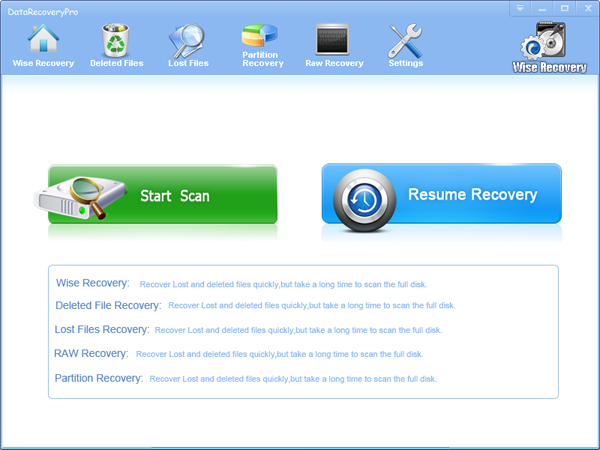 WiseRecovery is easy-to-use data recovery software that recovers lost and deleted data. It is designed and launched by Lionsea.com for a long time. It is professional on how to undelete emails and files and many other data in many different devices including hard drive, flash drive, memory stick, camera, PC, laptop and others you can imagine. 1. Download Wiserecovery, install it and launch it. Click the “Deleted Files” button on the main window of Wiserecovery. 2. Tick ‘Start scan’ to find all lost file types. 3. Select the file types you want to recover. 5.You will see you lost emails and you can save them in a safe place. People who work in office must use the word document everyday to store important data or edit any necessary document. But sometimes we are not accustomed to saving the file every time we finish an editing. Sometimes, we may encounter a computer shut down or system file corruption. Then the result is that the word document is lost or cannot be opened any more. Do you regret not saving the file instantly? But regret cannot help you get the word files back. In this situation, many people choose to restart the work and do the job one more time. This is really time consuming. And you may lose some original ideas. This is a bad thing. Actually the lost word files can be recovered with some methods. 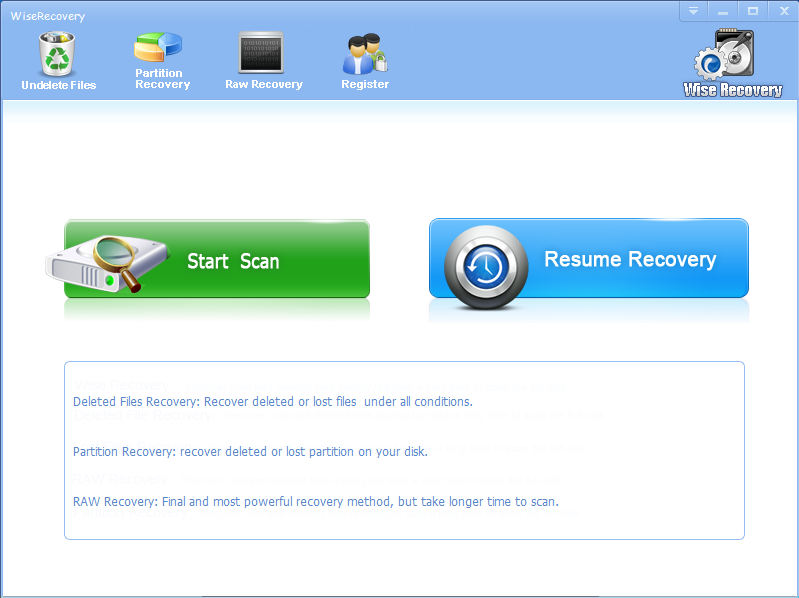 Nowadays, some software company are trying to develop data recovery tool to help users recover their lost files.One of them is WiseRecovery. It is developed by top engineers of computer technology. Many people have got back their important data with WiseRecovery. Recover word files with original data. Recover pictures with original dimension. Camera, SD card, Memory Card, Cell Phone, USB, PC, MP3 and more. To recover lost word files is not difficult if you use WiseRecovery. WiseRecovery can do a good job in digital media files recovery. It cannot only recover all the common file formats, but also recover some uncommon ones. During the process of scanning, it discovers your lost media files automatically and sorts them into different categories according to format, which will help you find the files you want easily. XD cards are common memory cards which are usually applied in digital cameras. They are most common in Olympus and Fujifilm cameras. XD cards are used to store picture and video files and can transfer these files onto your computer’s internal hard drive, or onto a portable storage device like a flash drive. In order to transfer pictures and videos from an XD card onto your computer, you will need an XD card reader, which your computer may have or which you can purchase at an electronics store. If you accidentally delete files from your XD card, while formatting them, for example, you can recover them with a downloaded data recovery program. However, what if accidently delete photos from XD card? Mistakenly press “format” in your digital camera? All of us know the photos contain important memory of our life. If the photos of XD card are missing or deleted unintentionally, we will feel extremely upset. Don’t worry. We will introduce you how to recover lost photos from XD card. Then how to recover lost photos from XD card? In this article, we will provide you an efficient and effective method. WiseRecovery is an easy-to-use card recovery software that can effectively recover deleted or lost photos, music, video, and multimedia files from almost all digital cards after instances like deletion, corruption and formatting, etc, which is Professional Memory Card Recovery Software, Recover Lost or Deleted Photos in 3 Steps. STEP 1 Download Card Recovery Tool & Install it for free. . ( Note: If the download link doesn’t work you may need to Download it from a Download Mirror). STEP 2 Run the WiseRecovery software. Click [Start Scan], specify the drive letter, file type and destination location. Then click [Next] to start the scan. As the development of living condition, more and more people pay much attention to spiritual function of a product, and they do not care much about physical function now. Lots of people prefer to spend much money on purchasing an SLR camera. They care much about the quality of their photos. Therefore, the photos are important for them. Once it was deleted by accident, people want to find the most efficient way to find their photos back. Although there are various recovery software in the market, the software which can recover the SLR camera photos can seldom be found. WiseRecovery can recover the SLR camera photos easily. WiseRecovery is easy-to-use card recovery software that recovers deleted/lost photos, music, video, and multimedia files from almost all digital card sources after disasters like deletion, corruption, formatting. The program enables the quick recovery of photos from different storage devices in just a few steps. WiseRecovery acts the most important role in the recovery software market, which is famous software that helps you recover lost data from Hard Drives, PCs and Laptops, Memory Sticks, USB storage media, SD card, cameras, cell phones or other storage media. It performs read only operation and will never do any damage to your card or hard drive. WiseRecovery also can recover your deleted or lost files due to situations of corruption, formatting, virus attack, etc. With WiseRecovery you don’t need to worry about your lost data any more. STEP 1Download WiseRecovery & Install it for free. . ( Note: If the download link doesn’t work you may need to Download it from a Download Mirror). STEP 3 When the scan is finished, select the files you want and click [Recover] button to restore the files.